An au pair is a woman or man who comes to the UK to study English language and culture by living with an English-speaking family. The au pair receives food, a room and a small amount of money in exchange for helping to look after the children and assisting with housework (for a maximum of 5 hours a day, 5 days a week). A demi au pair (or demi pair) is similar to an au pair but works shorter hours (perhaps less than 3 hours per week) and is paid less. An au pair plus works longer hours than an au pair (6 or 7 hours per day) and is paid more (usually both parents in the family are working). A holiday au pair usually works during the school sumer holidays (from July to September) and goes on holiday with the family. Most jobs are live in, meaning that you stay with your host family (host mother and host father). Some jobs are live out. If you responsible for looking after a child alone, this is known as having sole charge over the child. A nanny is a qualified child carer, responsible for looking after the safety/development/education of a family's children. Most nannies have obtained the CACHE (Council for Awards in Children's Care and Education: http://www.cache.org.uk) diploma or the former NNEB (National Nursery Examination Board) certificate. A nursery nurse is someone who has been trained to look after young children (for more details, see the local government careers page: http://www.lgcareers.com/careers/profile.asp?74 or the website of the Professional Association of Nursery Nurses: http://www.pat.org.uk). A childminder is somebody who works in her (or his) own home taking care of other people's children. Such people have to be registered with OFSTED. A babysitter is someone who takes care of a baby or child while the parents are out, usually by going to their home. A mother's help (or a parent's help) is a person (usually aged 16-20) who helps a parent with housekeeping and looking after the children. A home help or housekeeper or domestic is someone who does housework such as cleaning (the job does not involve looking after children). A nursery school or kindergarten (also known as pre-school in American English) is a school for children between the ages of 2 and 5. A day nursery is a place where groups of young children are looked after during the day, for example while their parents are working. A primary school is a school for children between the ages of 5 and 11. An au pair is not normally expected to look after a young child without help. If you can drive, you should bring an international driving licence to the UK (see the Travel/Transport/Car section for more information about driving in the UK). Au pairs are sometimes asked to teach their language to the children (especially French, which is the first foreign language in British schools). Nationals of most EEA countries are allowed to work or study in the UK, so you can work as an au pair if you want. Some restrictions have been placed on citizens of Bulgaria or Romania who wish to work in the UK, so if you are from one of these countries you should check the current situation with the British embassy in your country. 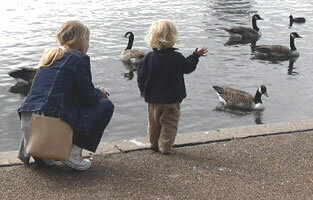 Both countries had au pair agreements with the UK before they joined the EU and EEA in January 2007. Note that au pair visas are no longer available. The IAPA (International Au Pair Association) is the international trade association for qualified au pair agencies / companies. To find an IAPA agency in your country, you can go IAPA's website at http://www.iapa.org, select "Organisations and Agencies", click on the "List of Members" link and select your country. Contact these agencies to see if they can help you to find a suitable au pair job in the UK. You can also find agencies using Yellow Pages: http://www.yell.com (What? "Nanny & childcare agencies" or "Baby sitting & childminding services" Where? your town or the first half of your postcode). Usually there are no charges for using an agency (the costs are paid by the family, not by the au pair). There are many advertisements for UK jobs in The Lady magazine: http://www.lady.co.uk. See under Domestic: Situations Vacant in the British Isles in the Situations and Appointments section. The magazine is published every Tuesday and is available from newsagents. As well as replying to advertisements, you can pay to place your own advertisement in the Situations wanted section. You should also check local newspapers, as well as noticeboards in the windows of local newsagents or in local supermarkets. You can search for available jobs and submit your own details. You may want to check online job agencies. The most popular of these are listed on the page: Work/Search. In most cases you should apply by sending a hand-written covering letter and a typed CV (a summary of your qualifications and experience, sometimes called a curriculum vitae or a resume). An example of a British-style CV (also called a curriculum vitae or a resume) is shown in the Work/CV page. If the job is advertised online, you may be asked to apply instead by filling in a form online or by sending an e-mail. The covering letter (or the message of the e-mail) should give a brief summary of why you are applying to this family or agency, and what experience you have looking after children. If you don't smoke, you may want to state that you are a non-smoker. You should include references: usually the names, addresses and home telephone numbers of people you have worked for previously. If this is your first job looking after children, provide references from responsible people who know you well and can describe your character (these are known as "character references"). Always be honest in your CV. If there are any times when you were not at school or working, include a note explaining the reasons for these gaps. In the "Other Skills" section, remember to state if you have a driving licence which allows you to drive in the UK (see: Travel/Transport/Car). Also mention if you have any "first aid" qualifications (basic medical training to deal with minor injuries or emergencies). The family will want to know how well you speak English, and you should list any other languages which you can speak fluently. If you are sending your application by post, include a stamped addressed envelope for a reply (attach international reply coupons instead of a stamp if you are outside the UK). What are the pay and working hours? An au pair is usually given free food and accommodation, plus a reasonable amount of money (usually between 40 and 60 pounds per week) for daily living costs. You can be asked to work up to 25 hours a week (up to 5 hours a day for 5 days a week) and may babysit up to twice a week. At least 2 days a week should be given to you as free time. Au pairs from the EEA (European Economic Area) can choose to work longer hours for extra pay (an au pair plus job). What do I do if I have problems? You may also ask for help at your nearest Citizens Advice Bureau. See: Personal/Advice. - Smoking: Tell the parents if you smoke; if necessary, agree to limit this to your room or outside the house. - Drinking: Avoid drinking while you are looking after the children, and don't drink alcohol that is left in the house. - Privacy/space: Ask which parts of the house you can use and find out when the parents want to be left alone together. - Telephone: Always ask for permission before using the telephone. Buy an international telephone card if you call abroad, and make sure that the parents know that you are paying for the call. It is better to buy your own mobile telephone to arrange your social life (see: Life/Telephone). - Car: If you are allowed to drive the parents' car, always ask before using it. If you use it for yourself, offer to pay for the petrol (for example, by filling the petrol tank afterwards). Drive carefully: always wear a seatbelt and make sure other passengers do as well. If you damage the car, be honest about it - don't pretend that nothing happened. - Friends: Make sure you know if you are allowed to invite friends into the house. Many parents do not like to allow your boyfriend or partner to stay overnight or to be with you while you are working. Occasional overnight guests may be allowed, but arrange this in advance with the parents and make other arrangements if they are unhappy about it. Avoid getting too close to the father, and avoid anything which might make the mother feel jealous. - Late nights: If you plan to stay out late at night, tell the parents. Be as quiet as possible when you return and make sure that you lock the door safely. If you often stay out late, the parents may worry that you are too tired to do your job properly, you may disturb their sleep, or they may worry about your safety. - Violence: Never hit the children because you are angry. Agree with the parents about acceptable ways of telling off the children if they are behaving badly.